The Romney Marsh is a 100 square mile area of Marshland on the south coast of Kent bordering to the West on Sussex. It is almost entirely below high tide level and is criss-crossed with water channels and marshlands. 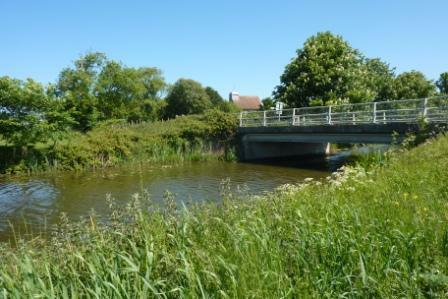 The main towns surrounding the marsh are Rye, Ashford and Hythe. The rich fertile soil make it ideal for agricultural purposes and it was traditionally principally used for pasture although more food production began during WWII. 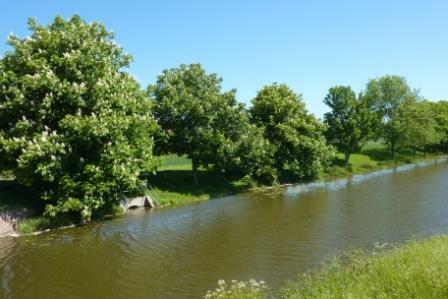 It is a region of mists, myths and legends and a notorious home to smuggling gangs who could gain easy access from the coast via the Royal Military Canal from Hythe. The scattered communities and difficult terrain would also have made it a perfect hiding place for their goods. Until relatively recently it was a most unhealthy place to live as the stagnant marshes provided a perfect breeding area for mosquitoes and so the population was prone to “Agues” or fevers one of which we would know as Malaria. The infant and child mortality rate was therefore even higher than would be expected for the times and in many years burials exceeded baptisms. My interest arises from my mystery John Cook born about 1884 in Folkestone, Kent. Until recently I had neither, birth nor his marriage to Susanna about 1806 just the fact that he was a smuggler and went down with the “Jane” on a smuggling trip in the winter of 1822/3. A marriage has now been found to Susanna Fagg on 20th October 1807 at Bonnington. John is described at marriage as “of Folkestone”. This would be a good fit for my John Cook from the date and location in a village not far from Folkestone and one very well known for smuggling activities. 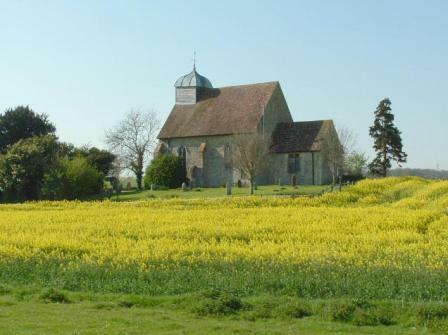 Bonnington is a scattered rural parish about 6 miles SSE of Ashford on the B2067 between Tenterden and Hythe. The village was recorded in the domesday book as Bonintone: William son of Gross from Hugh de Montfort. It had one church. 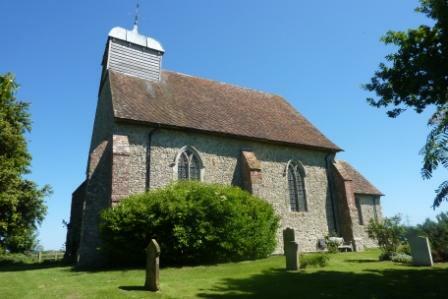 The 14th century Parish church is the Church of St Rumbold and was built on earlier Saxo-Norman foundations. Even today there is no electricity and the church is lit by candlelight. Parish registers begin 1564. 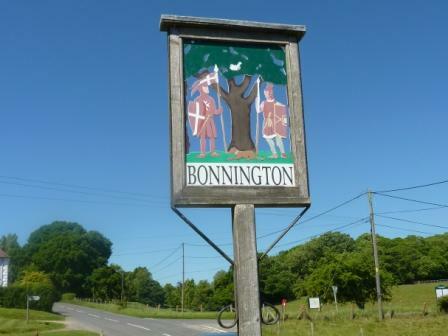 Bonnington is in the Romney Marsh registration district. The village borders on the Romney Marsh and became associated with smuggling. 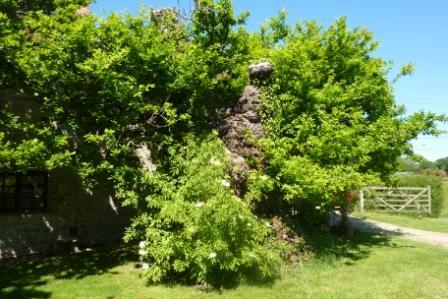 It was linked with the nearby village of Aldington and with the notorious Aldington Gang. After the Battle of Brookland in 1821 between the Customs and Excise Men and the gang, George Ransley took over as leader and it became the Ransley Gang. 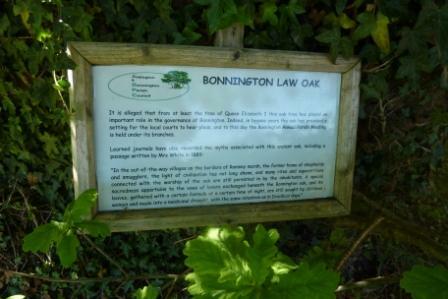 From at least the time of Queen Elizabeth 1st, an old oak tree known as the Law-Day Oak provided the setting for Courts held to hear local pleas, and to this day the Bonnington Annual Parish Meeting is held under the branches of this ancient oak. 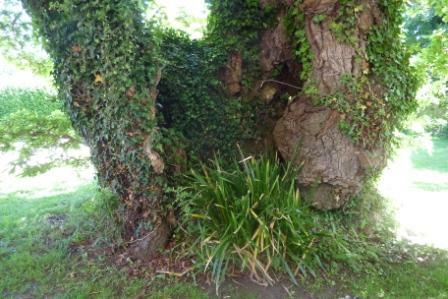 It is possibly not the magnificent tree it once was, but it is over 500 years old. Brookland is a small rural parish about 12 miles south of Ashford on the A259 between Rye and New Romney. The present Church dates from about 1250 with some evidence of earlier remains. 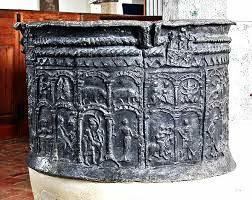 The Norman round lead font dates from 12C. Around its circumference are panels with reliefs showing the 12 Zodiac signs and the typical labours of each month. Parish Registers begin in 1538. The striking feature of the Church is that the Steeple or Bell Tower is entirely separate from the church. 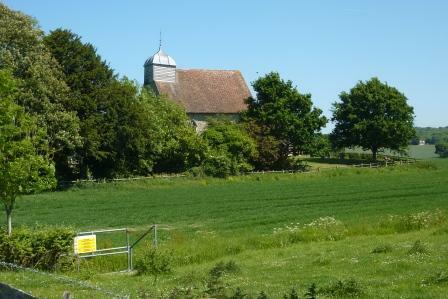 Although various legends account for this the reason is that the marshy ground could not support the full weight if it were part of the church. Originally in 12C it was an open framework built to take a large bell for the purpose of warning against flood and invasion. The framework was exposed for about 300 years. In the 15th century the Church Bells were put into the framework and the candle snuffer shaped roof was put on, this was made of weatherboard. In 1936 it was shingled and was reshingled in 1990 after hurricane damage in 1987. 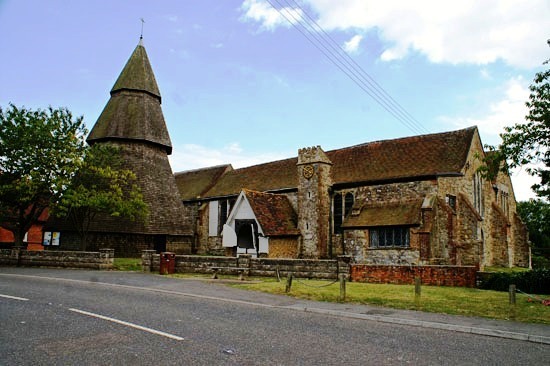 The village is on the Romney Marsh and became associated with smuggling and linked with the notorious Aldington Gang. In February 1821 the Battle of Brookland took place between the Customs and Excise Men and the Aldington Gang. The smugglers sent 250 men down to the coast between Camber and Dungeness to unload a cargo of goods, which they did successfully. However, the party was spotted by the Excise Men and a fight took place over Walland Marsh. They were chased across the Marshes until they reached Brookland, where the Gang turned on the blockade force. Five men were killed in the fighting and there were more than twenty wounded. The leader at that time was Cephas Quested who was arrested, sentenced, and taken to Newgate where he was hanged for his activities on 4 July 1821. George Ransley took over as leader until he and the gang were captured in 1826. George Ransley was transported to Tasmania, his wife and one of his 10 children joined him later (the other 9 did not survive the journey), he was given a pardon in 1838 and farmed at River Plenty, Hobart until his death in 1856.